* a detailed guide on how to write and present a Masters, including a glossary and checklist for finding guides, reference books and other study sources. 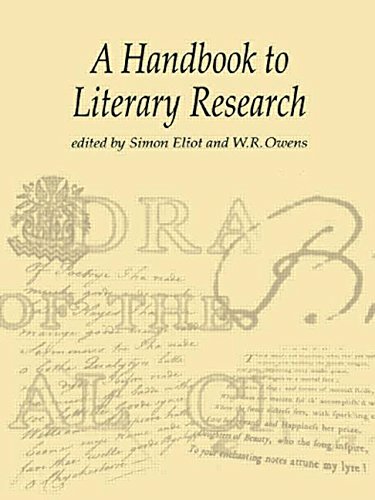 A Handbook to Literary Research has been written specifically for students embarking on an MA in Literature. It provides an introduction to research techniques, methodologies and information sources relevant to the study of literature at postgraduate level. Divided into sections this guide begins by offering a practical guide to the uses of research libraries; research aids such as bibligraphies and perodical indexes; and computers, especially the Internet. Section two introduces students to the work of textual scholars and bibliographers, focusing particulary on the practical and theoretical issues faced by textual editors in their effort to produce reliable texts of literary works. The third section explores connections between literary research and literary theory, outlining how developments in thinking about literature during the twentieth century have opened up new ways of doing research within literary studies. Five contemporary theoretical approaches are outlined here: feminist theory, deconstruction, reader-response and reception theory, new historicism, and post-colonial theory. Finally the Handbook offers detailed guidance on how to write and present an MA dissertation. A glossary and checklist for finding guides, reference books and other sources for study are also included. This book the only of its kind, and will be a vital resources for students on any MA Literature programme. It will also be useful to those undertaking private research in Literature or related fields.